for breakfast in the West 50s? This is the egg white frittata at Norma’s in Parker Meridien where breakfast last till 3 pm. Michael’s media moguls favor the reduced-risk egg white omelet. You’ll find Tony Bennett’s cinnamon raisin and pecan French toast with fresh strawberries and real Vermont maple syrup at Brooklyn Diner on West 57th from 7 am on. Pancakes come in several flavors – Old fashioned, Valrhona Double Chocolate Chip, even “Alexa’s organic eggless blueberry buckwheat pancakes made with oat milk. 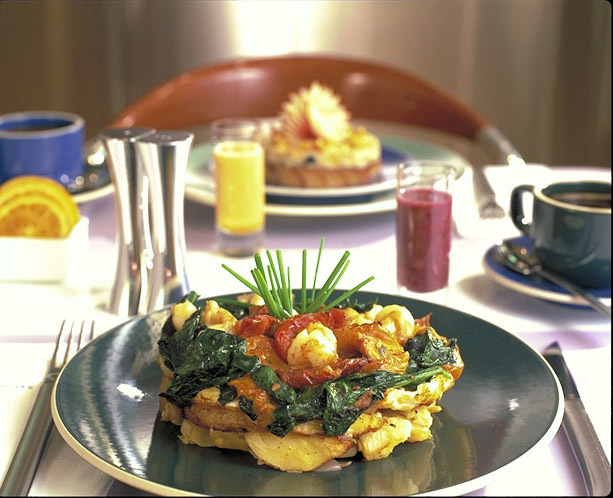 Smoked salmon or sturgeon comes scrambled with eggs and onions, “The New York legend,” the menu boasts. Brooklyn Diner's red velvet waffles come with fresh fruit, warm vanilla icing. The red berry risotto at Norma’s is a savory wakeup. Tourists who come to watch Michael’s power breakfast order eggs benedict. Breakfast in Nougatine has a Jean Georges imprimatur, though it’s basically traditional. Don’t expect scrambled eggs brûléed or sweetbreads on toast. (1 Central Park West. 212 299 3900) Across the street in the Time-Warner Building, Marc Murphy’s Landmarc does breakfast too - priced for casual encounters. Landmarc has hashed browns, not home fries…and 15 different omelets. (10 Columbus Circle 3rd Floor. 212 m 823 6123). Click here to return to Ask Gael listings.